Up to date, few attentions have been given to the special characterization of water-soluble inorganic ions (WSIs) in the submicron atmospheric particles. 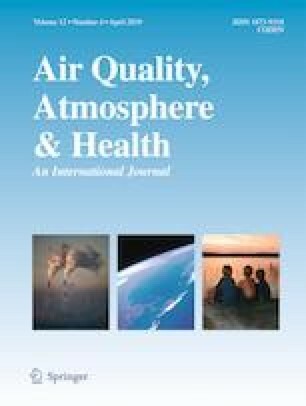 In this study, to implement a highly size-resolved characterization of WSIs in the submicron atmospheric particles, ten sets of size-segregated submicron atmospheric particles were collected in Hangzhou (China) from November to December 2015, with cut-off diameters of 0.060, 0.108, 0.170, 0.260, 0.400, 0.650, and 1.000 μm. The particulate WSIs, including Cl−, NO3−, SO42−, Na+, NH4+, K+, and Ca2+ were analyzed by ion chromatography, and their mode distributions and potential sources were assessed. It was found that the particulate WSIs constituted a substantial part (40.4~70.9%) in each fraction of submicron particles, of which the secondary inorganic ions (SO42−, NO3−, and NH4+) were the dominant species. The sulfur oxidation rate (SOR) and nitrogen oxidation rate (NOR) were increased when the submicron particles became coarser, indicating the enhanced secondary formation processes of SO42− and NO3− in the coarser submicron particles, thus resulting in the higher fractional contribution of secondary inorganic aerosols in the coarser submicron atmospheric particles. The correlation coefficients between K+ and Cl−, NO3−, and SO42− were 0.9293 (P = 0.002), 0.9702 (P < 0.001), and 0.9723 (P < 0.001), suggesting their dominant contribution from the biomass burning. Furthermore, it was found that PM0.4–1 (aerodynamic diameter of 0.400–1.000 μm) was a substantial part (66.6%) of submicron atmospheric particles. Compared to PM0.4 (aerodynamic diameter ≤ 0.400 μm), the concentration of WSIs in PM0.4–1 was prominently higher, and the secondary formation processes of SO42− and NO3− in PM0.4–1 were significantly enhanced. The online version of this article ( https://doi.org/10.1007/s11869-019-00687-8) contains supplementary material, which is available to authorized users.